For Isabelle’s 2nd birthday we wanted to treat her to an exciting day out, I’m not really one for throwing parties (the idea of a house full of children gives me shivers) so a day trip was honestly the best option for us. With her birthday being quite close to Christmas we wanted to keep to a budget, especially for family days out. Luckily I knew of just the right place to take her from visiting there myself on a school trip when I was younger (a lot younger). 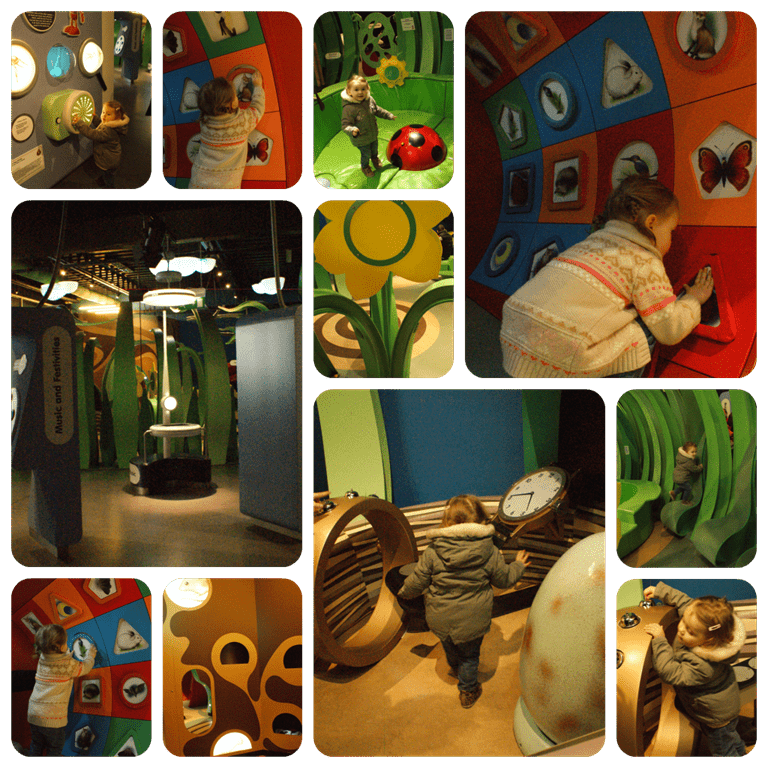 We were heading out to a fun filled day of learning and discovery to Eureka!, the National Children’s Museum in Halifax. On arrival Isabelle soon discovered how exciting Eureka! was. The path leading up to the building was almost as impressive as the glass building, laid out with creative outdoor children’s areas working their way up to the door. They are great for children to play in during the warmer months, but being winter we didn’t want Isabelle to spend too long outside. She had a quick five minutes entertaining herself outside before we whisked her off inside. Inside Isabelle was keen to point out the large feature that hung above the entrance, a clear bathtub filled with water which demonstrated the Archimedes screw invention. Being a little too young to understand she just stared in amazement but the Mr and myself were rather impressed with the feature. The museum is housed over two floors so I would advise to arrive early to get the full benefit of the day. Arriving just after 11am we had the whole afternoon to explore also being the festive period there was a special visitor at the attraction that day, Father Christmas. We purchased a ticket with the intention of visiting him after lunch. 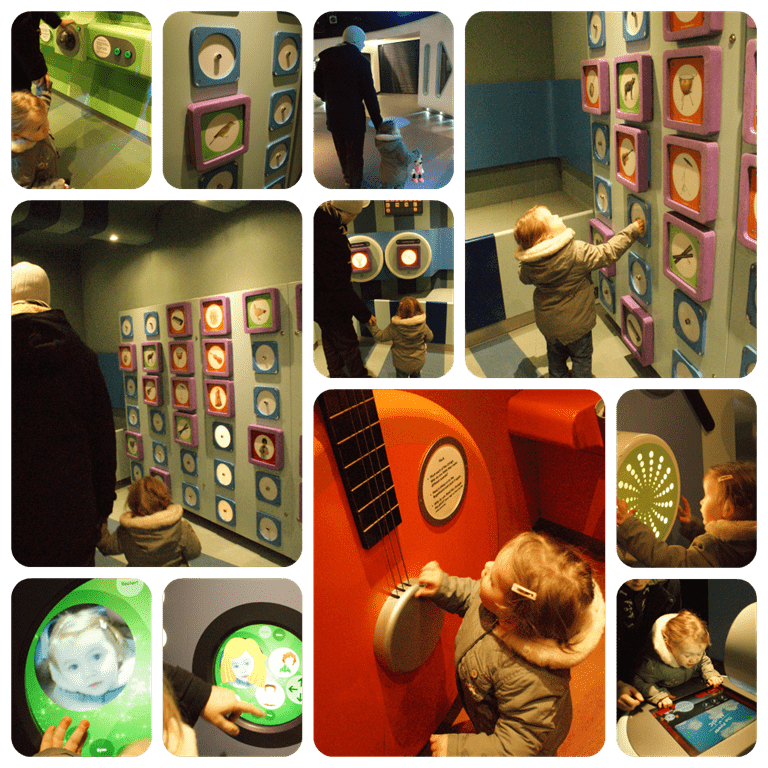 Out first port of call was to the Sound exhibits, Isabelle was soon off and in awe of everything around her with endless displays covering all of her senses. I was impressed with the amount that she understood and we stood back as she interacted with everything. She loved the tunnel in the sound garden which featured a full puzzle wall to allow children to match the animals and shapes to those that appeared on the wall. After completing the wall for the third time we decided that it was best we move on to another exhibit. By now, being lumbered with all the coats and bags, I started to feel like a donkey which the staff members at the visitor information desk had noticed. They kindly pointed out that we could use one of the lockers to store our bags so we could wander around without carting the bags and coats. On the other side of the building, the was a large atrium which was home to the Living and Working together exhibit. 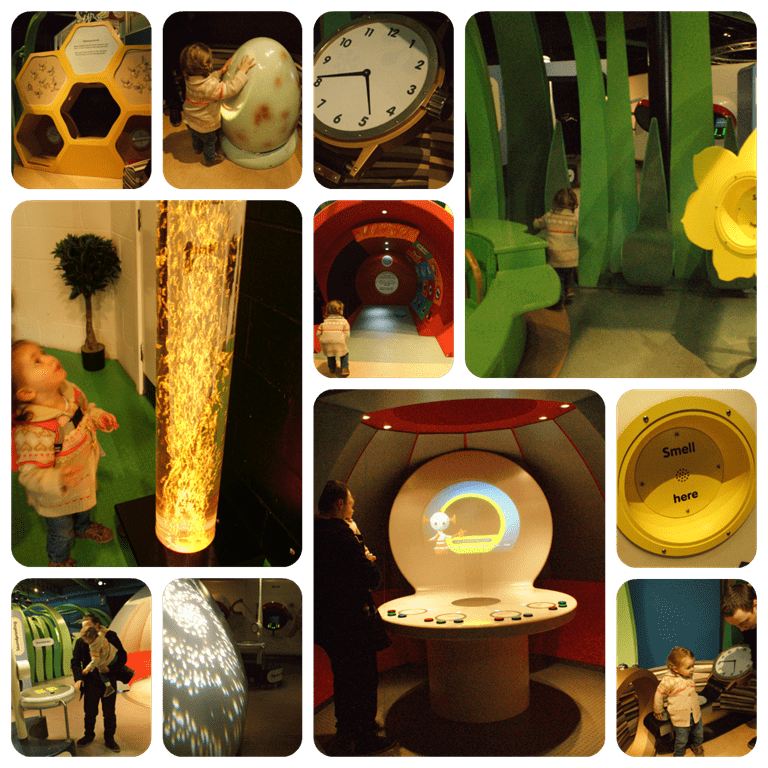 This was probably my favourite area, featuring a functioning house to explore and learn how everything in your household works and then a whole area which was a children’s role playing paradise. The Halifax bank with functioning Eureka cash machine, CCTV and a vault complete with safes to crack and discover the treasures within. I must admit that the Mr and I took this a little far too seriously and wouldn’t leave the vault until we had cracked all available safes. 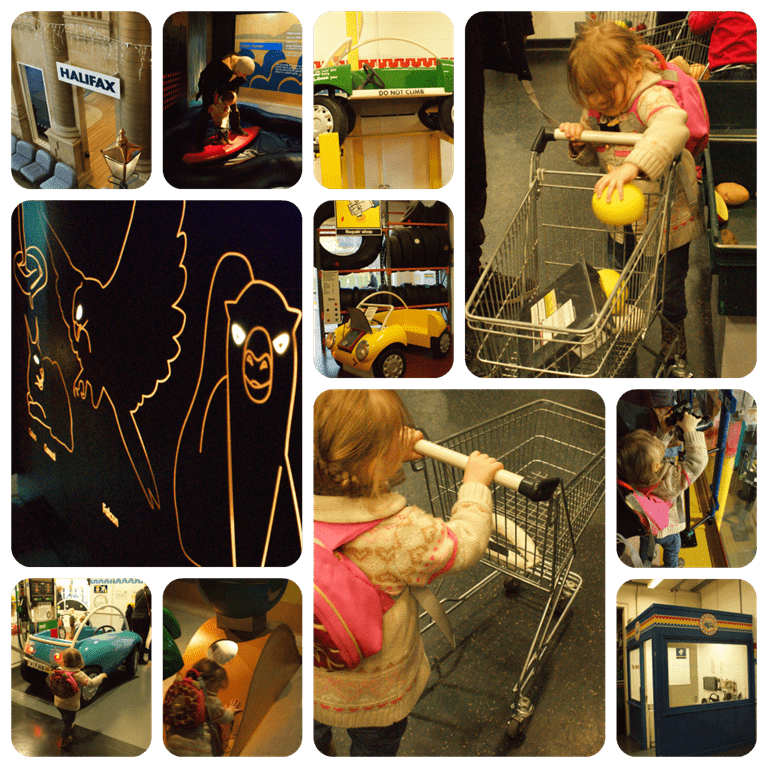 Isabelle’s favourite section from Living and Working together came in the form of a fully functioning M&S supermarket. Once in there, there was no stopping her, she grabbed a children’s sized shopping trolley and off she went filling her trolley with all kinds of food products. Only when she had completely filled her trolley to the point of it over flowing did she decide it was time to head to the working checkout to ring up her trolley. She loved every minute of scanning all of her products through the till whilst mummy and daddy attempted to put the quick flowing produce back onto the shelves. 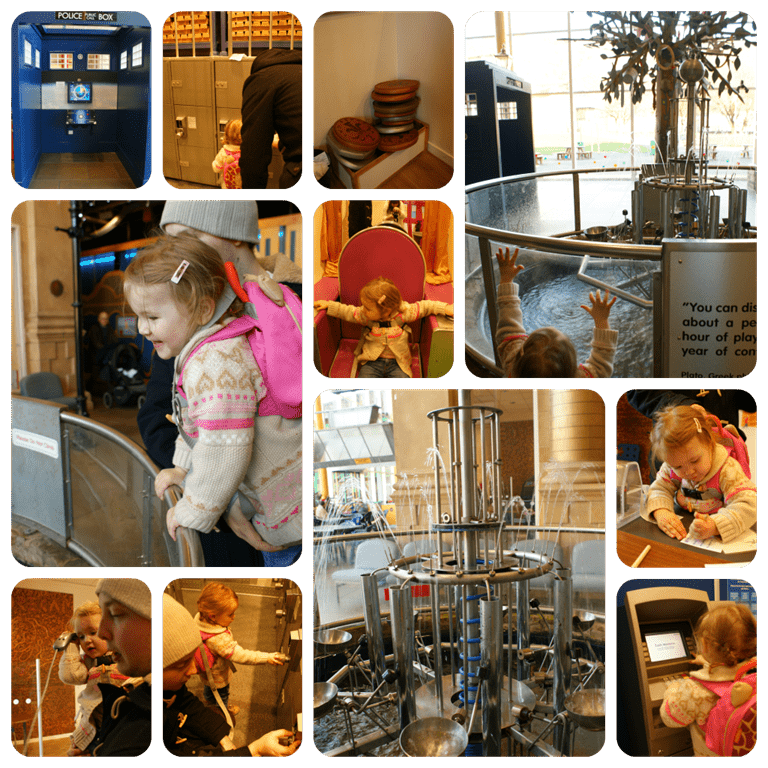 The living and working together exhibit also featured a police phone box, a car garage complete with cars and an operating car wash. Isabelle was desperately trying to see and take part in everything around her. The Mr had a go a changing a tire in the garage whilst Isabelle filled up a car using a very realistic petrol pump before heading over to the car wash.
After this area we headed back over to the cafe for lunch and discovered it was more than just your average cafe, the menus were well thought out, especially the children’s food which was perfect for even the fussiest little eater which included organic, fair trade and salt free options. 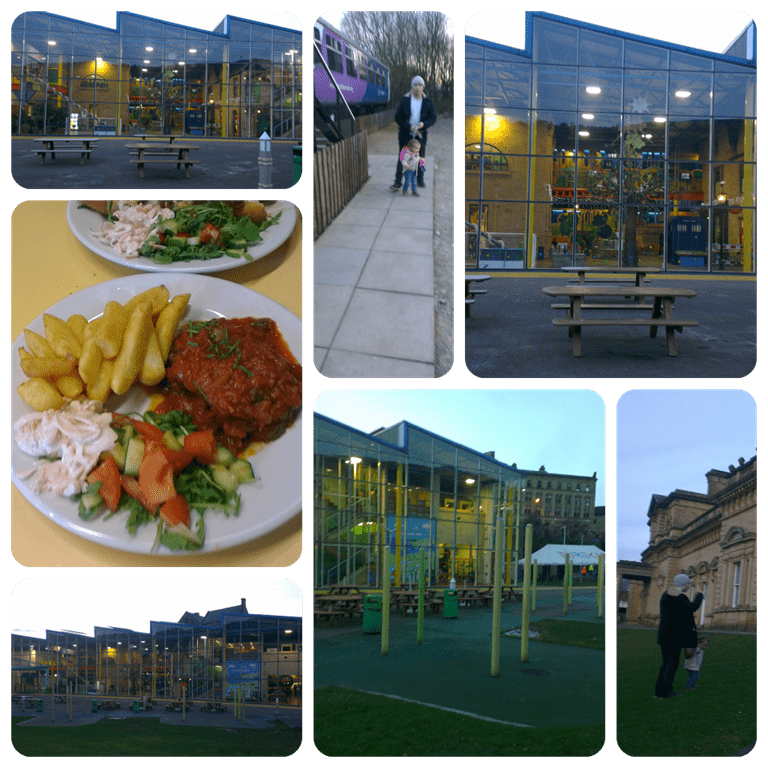 The meal portions were huge so provided excellent value for money. For those that had brought their own lunches, there is an indoor picnic area but in the warmer weather you also have the option to eat outside. After a well needed rest and a toilet stop we made our way up the stairs to visit Father Christmas, I was expecting a simple room with a chair but once inside we discovered a magical Santa’s grotto, with a very talkative Santa and a lovely elf who made Isabelle feel at ease on her first every visit to see the big man himself. 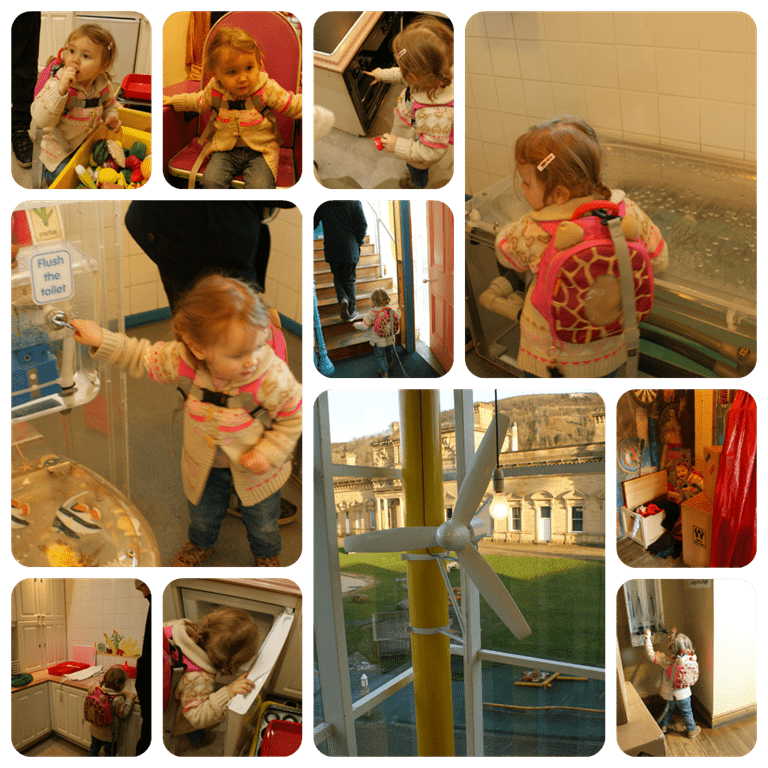 Our next stop was to dessert discovery which covered more sensory learning for Isabelle along with levers, puzzles and buttons to push whilst also learning about plants and animal homes. We also went on to look at life under the sea discovering sounds and the underwater environment, we even tried our hand at surfing. Upstairs we discovered a creativity room for the under 5’s which featured a large table full of crafting materials where we made Christmas cards to take home. There was also a water tray and activities, providing Isabelle with an apron she set to playing. Unfortunately the Me and My Body exhibit was closed due to refurbishment but it give’s us an excuse to go back and visit. The facilities could not be faulted, the toilets were immaculate and had children’s sized toilets and basins. Overall I can highly recommend a trip to Eureka!, I was a little worried that Isabelle might not be able to take part in much due to her age but I couldn’t have been more wrong. It is suitable for children of all ages and provides a fun and exciting way of learning. 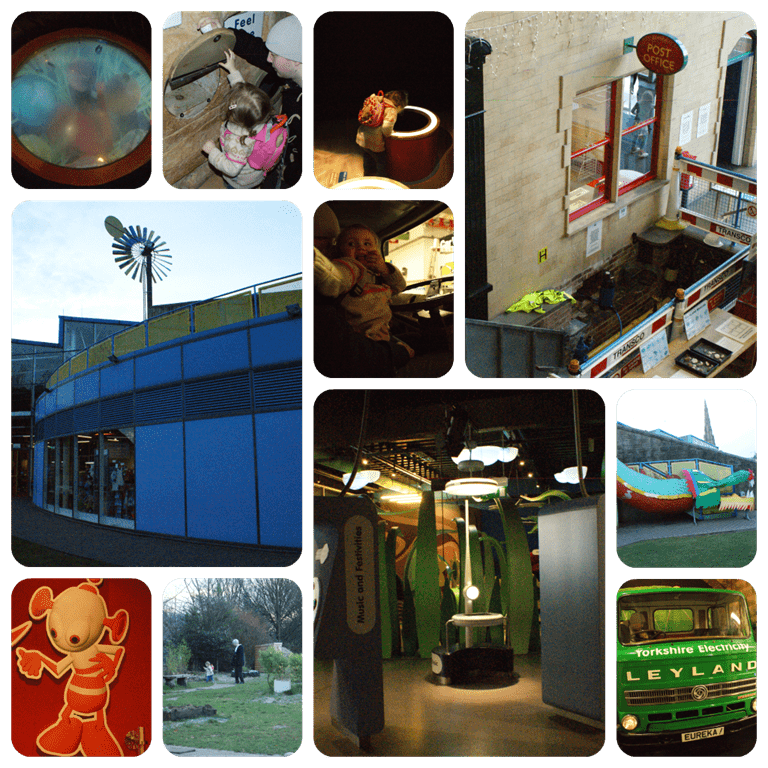 We had a fun filled day and cannot wait to go back. The admission fee’s are very reasonable, you can purchase a Family Saver Ticket which is what we had on the day with the option to upgrade to a years pass and Car parking is available and priced at £3 for up to 4 hours.